Dr. Chen Youth Masque dramatically reduces the appearance of fine lines and wrinkles, quickly leaving skin looking more luminous, youthful, and firmer. Dr. Chen® Youth Masque delivers potent hydrators derived from herbal botanicals to the upper layers of the epidermis in a soothing cream gel masque. “Hero ingredients” such as salicylic acid, a gentle natural exfoliant, and barley, which has exceptional moisturizing properties, leave skin feeling supple and soft, while locking in moisture. It also contains skin-rejuvenating antioxidants vitamin A, C, and B5. All of these factors combine to dramatically reduce the appearance of fine lines and wrinkles. 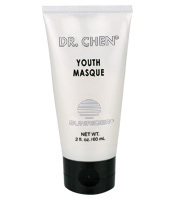 Dr. Chen® Youth Masque works wonders on all skin types and is a great choice for both men and women. Be the first to review “DR. CHEN YOUTH MASQUE” Click here to cancel reply.